As a citizen of the United States and most western nations, you are required a visa to enter Vietnam (more info from US’s Department of State Website). You can get the Vietnam visa from the US or abroad. Getting the Vietnam visa in the US can take up to 10 business days if you don’t choose an expedited service. The cost is USD 50 for regular service and up to USD 200 for expedited service (more information from the Vietnam Embassy). I recommend getting the Vietnam visa from Hong Kong where it is processed faster than the US. To get the Vietnam visa while you’re in Hong Kong, just go into the Vietnamese consulate located in Wan Chai. You do not need an appointment and the form is very simple. You will need one passport size picture which you can take at any nearby photo shop in Hong Kong. The fee to process an expedited / same day Vietnam tourist visa from the Vietnamese consulate in Hong Kong is HKD500 (around USD 65). Since the tourist visa is a single entry, one month visa, be sure you tell the Vietnamese consulate your exact date of entry as they will use that date on the tourist visa. 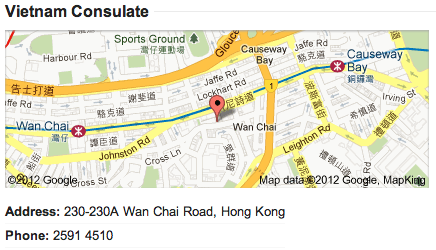 The Vietnamese consulate in Hong Kong processes visa from 10am to 1pm local time. In my case, I went to the office at 11:15am and received my Vietnam Tourist visa at 11:45am. I like the particular beneficial data an individual offer in the posts. I’ll search for a person’s weblog and check out one more time right here regularly. I’m modestly specific I’ll find out an abundance of completely new stuff the following! All the best . for the next! American tourist can easily get their visa in one day. It should be applicable for other countries also.